The mid-season premiere takes us to another planet (moon) where Supergirl discovers that her powers are not what makes her Supergirl. It is a fitting idea to take the narrative as it allows us to re-discover why Supergirl is an admirable hero. There are some wonderful moments with Alex/Maggie where we get to see them basking in happiness. Alex's declaration of 'I have a girlfriend!' was incredibly sweet and Kara's observation of her sister's glow provided some quality comedic moments. However, it felt strange to witness Alex's sudden insecurity when Supergirl became stuck on another planet, her albeit dismissal of her relationship with Maggie didn't feel natural for the characters at this point. But Alex's reasoning was understandable because she has always been relied upon to take responsibility for Kara, and so, when she is allowed to be happy, she instantly feels like something bad will happen. 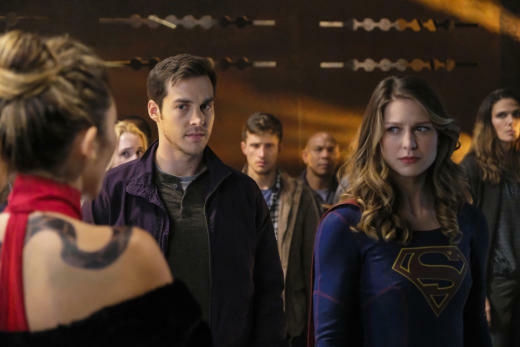 As Supergirl and Mon-El stumble upon a gateway to another world, searching for a missing girl, Winn is given a subtle sub-plot where he experiences a case of post traumatic stress after he is almost killed while on a mission with Guardian. This gave him an opportunity to develop and explore his psychological conditions which reflect our own experiences except with trips in space. There was a familiar spirit to Supergirl's optimism with her belief and faith in never giving up correlating to our current social crisis. Finally, there were engaging moments with Alex/Maggie, Winn's traumatic experience and Mon-El's decision to become a superhero all adding to an exciting and compelling viewing, with a science-fiction aesthetic that blended well with Supergirl's moral expression.